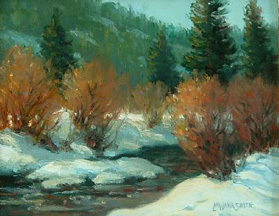 LaWana (Smithies) Smith, born in Long Beach California, resided in Kamas, Utah until moving to Bountiful, Utah in 1961. 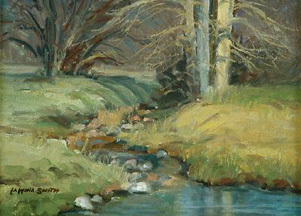 She studied art a Brigham Young University under the direction of Lorin Folland, who first introduced her to plein air painting. She furthered her instruction with Ken Baxter in landscape, plein air, Danny Baxter in figure studies and portraiture and Earl Jones and Paul Forster in landscape oils. She studied pastel portraiture under Del Parson. She also attended Weber State and Utah State Universities. 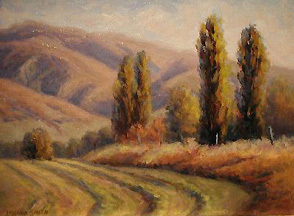 Her favorite landscape motifs are the rural settings of Utah and the Tetons of Wyoming. She interprets nature with poetic passages of paint to mirror her time and emotions for the beauty which surrounds her.